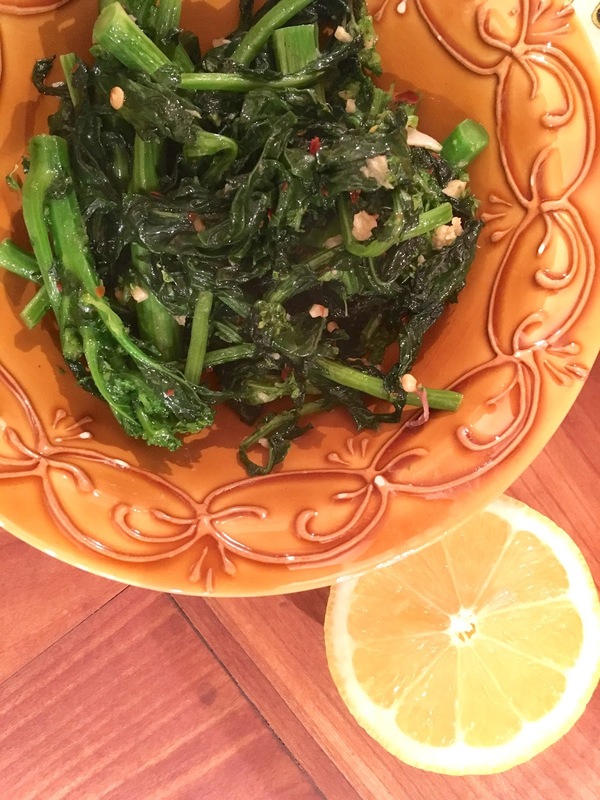 I'm loving that broccoli rabe is so much easier to find these days, it’s so good in pastas, risotto, or as a tasty side dish. Most often though I simply sauté it with garlic, lemon, and chili flakes. To start trim about an inch from the stocks then cut the remaining bunch into thirds. Heat a generous pour of extra virgin olive oil in a wide pot over medium heat. Add a quarter teaspoon of hot red chili flakes followed by the broccoli rabe and stir frequently for several minutes. Turn the heat to low and cover for ten minutes or until the stocks are tender. Increase the heat to medium, stir in three chopped garlic cloves and some more oil if necessary. Cook for another few minutes uncovered then squeeze half a lemon over the top and serve.